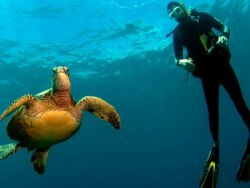 Lanzarote Canary Islands scuba diving holiday special offer INCLUDING DIVING! 7 nights self catering apartment including flights, transfers and 10 dive pack with PADI dive centre a few minutes walk away. 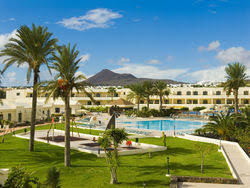 Stay in central Costa Teguise with local bars, restaurants, shops and sandy beach all within easy walking distance. Price includes return flights from London UK (Gatwick) other airports may be available with possible supplement, transfers, 7 nights self catering studio apartment on twin share basis. Dive pack is for qualified divers only. If not qualified then an amount will be contributed towards a qualifying diving course. Subject to availabiltiy. This PADI 5* Dive resort is located in Costa Teguise Lanzarote, Canary Islands. Established in 1999 with two schools, one located in Costa Teguise next to Playa del Jablillo beach and the second in Puerto del Carmen. Offering a range of courses for all levels with taster, kids, advanced and divemaster courses. Underwater photography courses also available. 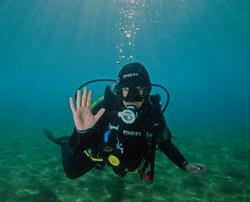 Guide to scuba diving sites from Costa Teguise, Lanzarote. A self catering apartment complex with 60 self catering apartments and 2 swimming pools in the heart of Costa Teguise just 350m, around a 5 minute walk from the beach. Easy to walk out to all the local bars, shops and restaurants, which are on your doorstep. Located in Costa Teguise within a 5 minute walk to Las Curchas beach and around 15 minute transfer from the airport. The Nazaret Apartments are split into two blocks; the more modern styled Apartments and more traditional, Mansions with a Canarian design set in spacious gardens. The accommodation offers a choice of studio, 1 and 2 bedroom self catering apartments. Facilities include: fully equiped kitchen with fridge freezer, oven, microwave, 4 top burner ceramic stove, kettle, coffee machine, toaster, iron, tableware, living room with television, safety deposit box, bathroom wiht bathrub or shower, tiled flooring, private terrace or balcony, views to the pool and free WiFi. 1 Bedroom Apartment (approx. 57m²) with view onto the pool has a bedroom with 2 single beds, a living room with a sofa bed, a fully-equipped kitchen with an oven and a 4 top burner ceramic stove, and a bathroom with a bath tub or a shower tray, a private balcony or a terrace and outside furniture. Maximum capacity: 3 persons (3 single beds). 1 Bedroom Apartment (approx. 57m²) with king size bed with a view onto the pool has a bedroom with a 2×2 m bed, a living room with a sofa bed, a fully-equipped kitchen with an oven and a 4 top burner ceramic stove, and a bathroom with a bath tub or a shower tray, private balcony or a terrace and outside furniture. Maximum capacity: 3 persons (1 king-size bed and 1 single bed). The Mansion Nazaret studios and apartments are designed in a more Spanish colonial-style apartment complex with large gardens consists of budget studios offering excellent value. The Studio Apartments (approx. 32m²) are a loft style studio apartment with 1 x double bed, an equipped kitchenette with tableware and a 2 top burner ceramic stove, a microwave and a a bathroom with a bath tub. Maximum capacity: 2 persons. The 1 Bedroom Apartments (approx. 40m²) has one bedroom, 2 x single beds, a living room with sofa bed, an equipped kitchenette with tableware and a 2 top burner ceramic stove, a microwave and a a bathroom with a bath tub. Maximum capacity: 3 persons. The 2 Bedroom Apartments (approx. 68m²) has two bedrooms 2 x single beds in each room, a living room with sofa bed, an equipped kitchenette with tableware and a 2 top burner ceramic stove, a microwave and a a bathroom with a bath tub. Maximum capacity: 5 persons. The complex shares 4 swimming pools. The Nazaret Apartments has two swimming pools, one small children’s pool, and the Nazaret Mansion Apartments has one pool in the central area. There are sun terraces, with deck chairs and cushioned mats. There is a restaurant offering breakfast buffet, dinner buffet style and pool snack bars. The apartments have a reception for assistance, open from 08:00am to 22:00pm with security guard from 22:00pm to 07:00am who provides check in facility after 22:00pm. The apartments offer a cleaning and towel service cleaning every other day and towels and sheets (with linen change up to 2 x per week). Other facilities include a small book exchange, computer and internet access, general information, car rental and excursion booking service. Wi-Fi is included in the entire facility. There is a coin operated laundry shared between the apartments. A complimentary bottle of wine is offered on the day of arrival per apartment and fresh bread every morning. Nearby there is also windsurfing, stand up paddle boarding, kayaking and surfin available to book rental and instruction in advance through Sportif. Simple self-catering apartments, excellent value and in a great position in Costa Teguise. Ideal for groups. If you prefer more modern decor, the Nazaret Apartments are a good choice.